The construction of the Palace of Bonifacio VIII is not the result of a unitary construction project: the resulting actions of merging, transformations and additions changed the architectural structure of the building. In total there are at least 15 construction sites, that may be dated between the X-XI century and the XVIII century. 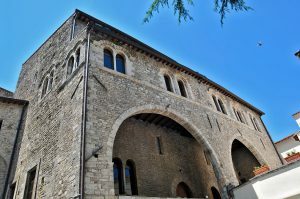 Palace of Bonifacio VIII in Anagni. The palace was built in the early thirteenth century on the paternal land of Cardinal Ugolino Conti who, become pope under the name of Gregorio IX, built the palace as his “wonderful abode”, although it was strongly marked by military features. The most likely hypothesis is that in the first half of the thirteenth century, a massive restoration project has turned into palace some earlier structures, consisting in at least two houses and a tower, with the contribution of Frederician workers. It is interesting that this phase of the building is simultaneous to another important construction site of the city: in the Cathedral the Cosmati were working for the paving of Basilicata and also the Third Master for the frescoes of the crypt. The construction took place, therefore, in a period of great financial resources and artistic commitment in Anagni, where the Roman and papal jurisdiction was connected with the private interests of the pope’s family. Pietro II Caetani, the nephew of Pope Bonifacio VIII, bought the building in 1297 from the great-grandchildren of Gregorio IX, Adinolfo and Nicola de Papa. In this phase the building was enlarged with the annexation of the east tower and the construction of the southern loggia, and became the most massive and ancient nucleus of the Caetani houses. The halls for the lodgings were the intermediate ones, on the ground floor there were the stables and warehouses, on the top floor and on the terrace there were garrison and defenses. The vertical connections between floors were insured by flight of stairs and spiral staircases. After the death of Boniface and with the subsequent transfer of the papacy to Avignon, Anagni underwent a demographic and economic meltdown. The city, that had been the backdrop to many of the major events in European history, went back to being a small town in the Roman countryside. Anagni lived a new period of economic, social, spiritual and cultural development only in the eighteenth century, a time when the Papal Palace was bought by the Cistercian Sisters of Charity, who still live there.